A significant step forward for the king of military simulation offset by inconsistent graphical performance. Simulation isn't the defining aspect of Arma. It's scale. The enormity of the map is the foundation for the experiences that distinguish Bohemia Interactive's flagship franchise. It's what makes radios, topographical maps, binoculars, and compasses practical equipment in an FPS. It's what allows for kilometer-long headshots and coordinated convoy raids. It's what makes using your eyes to spot hints of enemies--muzzle flashes, tracers, gunsmoke--as valuable as being a crack shot. The scale of Arma 3 dwarfs everything in the genre, including Arma 2. Altis, a keyhole portion of which is seen in these screenshots, is a Mediterranean island-nation assembled from ruins, airports, coastal villages, solar power plants, military outposts, salt flats, and tank-friendly scrubland. It's a variegated backyard for you to play war in, but what's more significant is that Arma's landscape finally has the technology it deserves. Fictional and adapted contemporary weapons, vehicles, and equipment make up Arma 3's armory. Arma 3 represents an aesthetic overhaul of the series. Unbelievable dynamic lighting, a volumetric cloud system, genuine vehicle physics, 3D weapon optics, ragdoll, noticeably improved weapon audio, and other grainy, eye-level details await scrutiny inside Arma 3's macro elegance. The best improvement is the merciful cutting of Arma 2's rigid, Tin-Man-without-oil combat animations, which makes infantry combat more responsive in your hands. A half-year in paid pre-release has given Arma 3 time to gestate, but the final build is far from being a comprehensive reinvention of the series, and some long-standing blemishes that arise from its nature as a gargantuan simulation linger. Even on high-end hardware, my framerate dips under the spectacle of some multiplayer missions. Friendly AI units, though marginally better-behaved, still depend on the player to be their brains, an issue that's circumvented by playing Arma the way God intended it: cooperatively. A tank percusses the ground after firing. With voice-connected friends and a good user-created mission, Arma 3 is an unparalleled war story generator. On Operation Fault Line with a gang of Steam pals, I had to drive a clumsy, eight-wheeled transport called a HEMTT across the map. To protect this elephantine truck we had a IFV-6c Panther, an APC with a mounted grenade launcher and 12.7mm MG. Minutes after leaving base, our tanky bodyguard eats a land mine, ruining its left track. As we get out to survey the damage, rockets streak across the valley. Everyone's okay, but the Panther is immobilized. Dumping the APC is the only option. We clump into the fragile HEMTT, burning diesel to get off the exposed ridge. Green tracers track the truck, eventually pricking some of my tires. The wheels don't deflate enough to go flat, but the suspension slumps to the left. For the rest of the mission I have to drive lopsided, constantly counter-steering just to keep the truck on the gravel road. But everyone works together to keep our war bus on track--my teammates give turn instructions, read the map, and scan the road for more mines. When we're free of immediate danger, we send someone back to base to retrieve an ATV so that we have a forward scouting element. At one point we position two machinegunners with nightvision scopes at the lip of a valley to provide cover as we drive the HEMTT down an exposed valley, then taxi them back to us on the ATV. The sequence of events, the chatter, the wounds and kills we rack up, all developed because we happened to run over a mine and our tires got shot up. Arma's capacity for stimulating camaraderie, atmosphere, and problem-solving, in other words, is fully intact. The feeling of ownership that arises over these moments between you and your squadmates sticks in your brain. 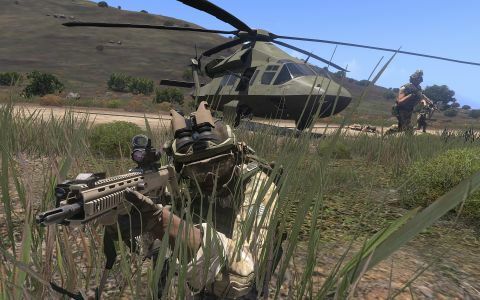 Central to this fun is how malleable Arma continues to be for its community, which before launch day had published almost 1,500 missions to Steam Workshop. Assuming you have an internet connection, this well of content compensates for the absence of an official campaign at launch, which will integrate in three free monthly installments beginning in October. On the ground, a new stance adjustments system is the best thing that's ever happened to infantry combat in Arma. Holding the Ctrl key as a modifier while tapping W or S cycles between nine vertical stances, and you can also take a horizontal step in addition to using Q or E to lean. You feel articulate--making small body adjustments while behind cover initially feels like finger gymnastics, but the system makes more types of cover viable and more types of weapons viable in that cover. Coupled with the general smoothing of movement and the near elimination of Arma 2's uninterruptible, sluggish animations, running and gunning should finally feel comfortable to average FPS players. On the opposite end of your gun, though, AI remains a shortcoming. Arma 3's enemies share plenty of their ancestors' DNA, which means that they oscillate between being eagle-eyed snipers at one moment and static, dumb, 3D silhouettes evocative of a light gun arcade game another. Their greatest flaw is that they lack personality, which mostly resigns them to being targets rather than soldiers. 3D weapon optics contribute a lot to Arma 3's infantry combat. Holographic, high-magnification, thermal, and other types of optics can be attached to almost every rifle along with other rail items like grenade launchers and flashlights. A few sparks of intelligence did impress me--after we killed the rest of his squadmates, I watched a rifleman flee for the first time in Arma, setting up a tense shot where I had a narrow few seconds to snipe him in the back before he disappeared behind trees. This is the sort of human behavior I'd love to see more of, stuff like blind-firing, limping, throwing smoke grenades for cover, claiming abandoned vehicles, or looting bodies for supplies--anything that would lessen the predictability. Friendly AI is even worse, unfortunately, because they're typically your responsibility. It's absurd that my squad's medic won't patch me up when I'm bleeding right next to him unless I order him to. Pathfinding isn't reliable, either: I spent five minutes repeating the “Move to…” and “Get in vehicle” commands, trying to convince a freed hostage and my squadmate to cross the map so we could finish the mission. They wouldn't budge. The crux of the issue is Arma's mile-long command menu, which scatters dozens of commands across all 10 numerical keys. Like the enemy AI, though, there are glimpses of authentic behavior. I felt like a proud parent when my AI fireteam, unprompted, broke formation and spread themselves behind cover during a raid on a cluttered factory. A night base raid. Arma 3's single-player missions are most enjoyable when you're not assigned the commander role. Bohemia's graphical improvements are substantial enough to make Arma 3 one of the most visually impressive games on any platform. Altis (and its little-brother island Stratis) are rendered with incredible clarity, illuminated by lighting that produces pink sunsets, blinding solar glare, and golden afternoons. I love the way the earth feels textured as you jog and crawl through it--gravel, sand, and grass all emit different sounds under your boots. I'm mostly happy with the graphical performance I've been getting on the three configurations I've been playing Arma 3 on. The caveat being that my framerate varies based on where I am on the map, the number of objects and enemies, and if I'm playing online. On a Core-i7 X990 at 3.47 GHz and two AMD Radeon 5970s on Very High settings, I've gotten 17-25 FPS on one single-player mission and 40-50 on another. Multiplayer is where I found the least-consistent performance. On a Core-i7 870 and GTX 780, I can get 55 FPS in a tight, six-player scenario on Very High, but 20 in a large-format mission like Wasteland. Tinkering with Arma 3's 25 configurable video settings allowed me to improve these numbers a little, but even dialing down the quality to standard or low on my rigs barely helped while playing large multiplayer missions. The scripting or complexity of some scenarios simply seems to bottleneck performance regardless of your settings. Some specific actions also consistently produced framerate dips for me, like turning 180 degrees with high draw distance, driving at high speed into a city, or right-clicking into gun optics for the first time in an area. Despite Arma 3's size visual and audial details like back-blasts and muzzle flashes feel handcrafted. If the downside of Arma's fidelity is its inconsistent graphical performance, its upside is that it reliably produces stories. Even its modular inventory system has produced little rituals for me in co-op, where I have everyone vocally recite the gear they're carrying to make sure we've got enough versatility. Sometimes, like some sort of weird mom commander, I inspect their backpacks to see that they're storing enough C4 and medkits. In these moments, you realize that the majority of Arma's realism doesn't exist for the sake of realism. I'm annoyed that it's still much more of a burden to command teammates than it should be, on par with chaperoning a second-grade field trip. It's bothersome that enemy AI oscillates between being smart and dull. I wish 40- and 50-player missions chugged less. And it's mildly disappointing that Bohemia delayed the release of the game's campaign, presumably in order to get Arma 3 out ahead of Battlefield 4. For most of us, the self-authored war that awaits in co-op is worth tolerating all of this.